Actor Ryan Gosling portrays Neil Armstong in First Man. Daniel McFadden/Universal Pictures. Damien Chazelle’s First Man is a thrilling, immersive depiction of NASA’s efforts in the 1960s to put a man on the Moon. Based on James R. Hansen’s 2012 novel of the same name, First Man focuses on Neil Armstrong (Ryan Gosling) and the harrowing test flights, bruising crash landings, and narrowly avoided tragedies that marked his involvement in the Gemini and Apollo missions – culminating in Apollo 11’s Moon landing on July 20, 1969. The film’s action sequences are breathtaking, giving viewers a visceral experience of the rickety, screeching, claustrophobic chaos of space travel in the 1960s. The filmmakers do an incredible job capturing the physical, logistical intensity of what was required – and ultimately accomplished – in getting humans to the Moon. And when the “Moon” moment finally arrives in the final act, it is stirring and grand. The film’s music, sound editing, and vérité cinematography make for a truly compelling cinematic experience. But for all its technical merits, narrative intrigue, and fine acting, something feels hollow. For a movie about so massive a historical event – one most people alive at the time remember watching with bated breath on TV – First Man feels strangely mundane, almost disconnected from its story’s significance and a broader sense of spiritual meaning. Why the Moon? First Man makes a point of juxtaposing Armstrong’s lofty space pursuits with his quiet, normal, clean-cut family life. Armstrong is a husband and father who goes off to work each day. It’s just that some days he goes into space and has to tell his boys he might not return. Naturally, Armstrong’s wife is at times frustrated with her husband’s semi-obsessive, always dangerous lunar ambitions. Playing Janet Armstrong is Claire Foy (Queen Elizabeth on The Crown). She does a fine job capturing the stress of a wife constantly worried about her husband ending up like so many of their astronaut friends who died in the space race. Indeed, one of the questions of the film is simply: Why? Why would Armstrong devote himself to so dangerous a task? Why would America invest so much money into the space race? Apart from bragging rights over the Soviets, what was it all for? 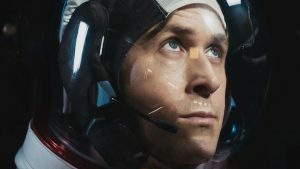 In the film, Gosling’s Armstrong can only say, “I don’t think it will be exploration just for the sake of exploration.” Later we see a clip of Kennedy’s famous Moon speech (“We choose to go to the Moon in this decade and do the other things, not because they are easy, but because they are hard.”). But beyond that the film doesn’t really grapple with the lunar mission’s raison d’être. Achievement at What Cost? Early in First Man we see Neil and Janet Armstrong doing everything they can to heal their 2-year-old daughter of a brain tumor. An aeronautical engineer and industrious aviator, Neil is a man who can fix almost anything. But he can’t fix his daughter Karen, whose death – the film suggests – ultimately fuels his passion to reach the Moon, whatever the cost. Chazelle depicts Armstrong as a man whose mission may compromise his own family, even as his family (particularly his late daughter) seems to inspire his astronaut ambitions. Absent Transcendence. One of the controversies surrounding First Man is what is absent in the film: namely, the iconic planting of the American flag on the lunar surface. But this omission (which is a bit overblown – the film does show the American flag on the Moon and elsewhere) didn’t bother me as much as another omission: the absence of any acknowledgement of God or faith, particularly the Christianity of Buzz Aldrin (Corey Stoll). The first man on the Moon may have been Neil Armstrong, but the first meal on the Moon was the Lord’s Supper. But this is not in the film. Armstrong, a deist, did not join Aldrin in taking communion, though he respectfully observed while Aldrin took the elements. For Armstrong, the Moon landing was about what men could accomplish: mankind’s “giant leap.” For Aldrin, the landing was a reminder of God’s glory and mankind’s relative smallness. What is man that thou art mindful of him? Armstrong’s “giant leap” line (of course) makes it into the film. Aldrin’s communion and Psalm-quoting do not. In fact, Aldrin is sadly portrayed as the film’s most unlikeable character. Secular Wonder. Is First Man inspiring? Yes. But its inspiration feels thinner than it could have been, in part because the film’s sense of wonder is mostly limited to wonder at what humans can achieve. Wonder at the technical prowess that led to men walking on the Moon (50 years ago!). Wonder at the power of cinematic art to so realistically capture the astronaut’s experience. Wonder at the bravery and innovation of the Greatest Generation. These are wonders indeed. But what about the wonders Aldrin pondered as he took communion and declared the praises of Psalm 8 in space? What about the wonder of a Creator who created the very atmosphere his image-bearing creatures learned to break through? What about the wonder of an unfathomably large universe that is still only a speck on the canvas of eternity? Without this higher level of wonder and meaning, even the greatest of humanity’s accomplishments – even walking on a moon – can feel, in the end, somewhat pointless. 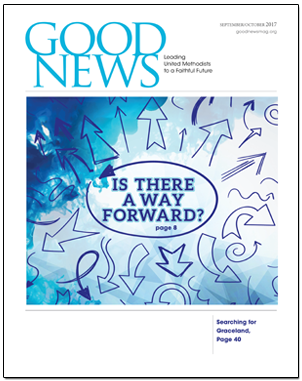 Brett McCracken is senior editor at The Gospel Coalition and author of Uncomfortable: The Awkward and Essential Challenge of Christian Community. Originally published at The Gospel Coalition. Used with permission.